The yen remained at a four-year low against the euro and a six-month low against the dollar in early trading this morning, with the risk rally inspiring investors to use the low-yielding currency to buy riskier assets. The Bank of Japan’s commitment to maintaining an ultra-loose monetary policy in an effort to reverse the 15-year deflationary trend has seen the Japanese currency assume the status as funding currency of choice. Data released this morning is expected to show that the world’s third-biggest economy is steadily recovering. 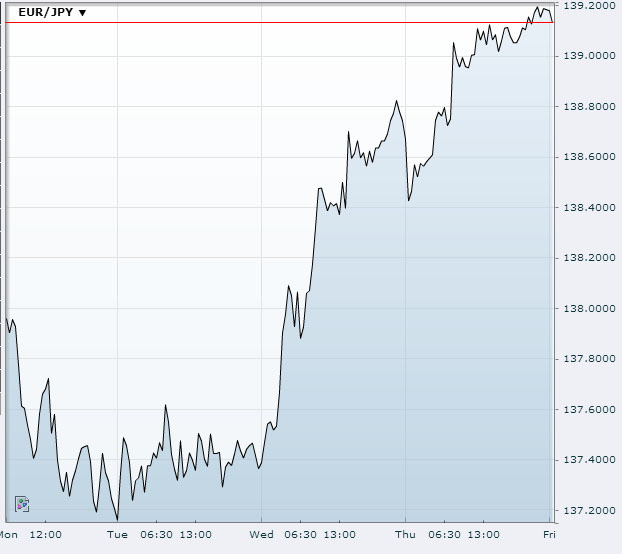 The euro has been increasing steadily against the yen since Wednesday, and is close to the June 2009 peak of 139.26. A break above this level could take it to levels not seen since October 2008. The dollar is also nearing its May 2013 peak of 103.74, having hit a six-month high of 102.375 overnight.Over the course of the month, the euro and the dollar have both risen around 4% against the yen, one of the biggest monthly gains this year. “The yen crosses are up across the board for the month due in large part to expectations that the Bank of Japan will offer a follow-up stimulus program to April’s unprecedented injection,” said DailyFX chief strategist John Kicklighter in a note, adding that this morning’s data will be watched closely by investors and analysts. Meanwhile, the euro rose against the dollar after German data suggested that inflation in the eurozone could be higher than expected, reducing the chances that the ECB will intervene further to prevent deflation. The euro hit a one-month high of $1.3619, and is on track to post a third successive week of gains against the greenback, leaving the dollar index wallowing in a three-week trough set earlier this week. The pound has been performing even better against the dollar, hitting an 11-month high of $1.6358 after the Bank of England scaled back stimulus for the housing sector. The Australian dollar had a bit of respite, bouncing above US$0.91 after company spending data and investment plans came in above forecasts, which makes another interest rate cut less likely. TThe Aussie bounced above 91 U.S. cents, pulling away from a three-month low of $0.9065 plumbed earlier in the week. Next Tuesday, Australia’s central bank holds its final policy meeting for 2013, and is expected to keep the cash rate unchanged at the record low of 2.5%.